I’m gonna do it. Normally I am a small project person, but after all of this fleece processing, I feel the urge to knit a sweater with handspun, handprocessed, local yarn. Something cozy, Saturday wear, not overly complicated, and in aran weight. It’s from one of my recent fleece purchases…It’s lofty, has spring to it, and will make a great sweater. I have knit sweaters before…but I have not spun the yarn for a whole sweater yet, so this is a long term commitment! I don’t want it to find a home in WIPland…. Any pattern recommendations? Who’s gone from fleece to sweater before? I’m gonna need some encouragement! PS. What do you think of my new design for the SeattleSpinner logo??? My friend designed it based on the idea that’s been lodged in my brain for a while and I think she nailed it!! This entry was posted in Fleece Processing, knitting, Spinning and tagged handknit, handspun, knitting, Spinning by Leah. Bookmark the permalink. Look at that yarn, all shiny and fluffy! I’ve done fleece to sweater twice and am in the process of a third. When I say in the process, I mean I am at the point of spinning, so it will be awhile. 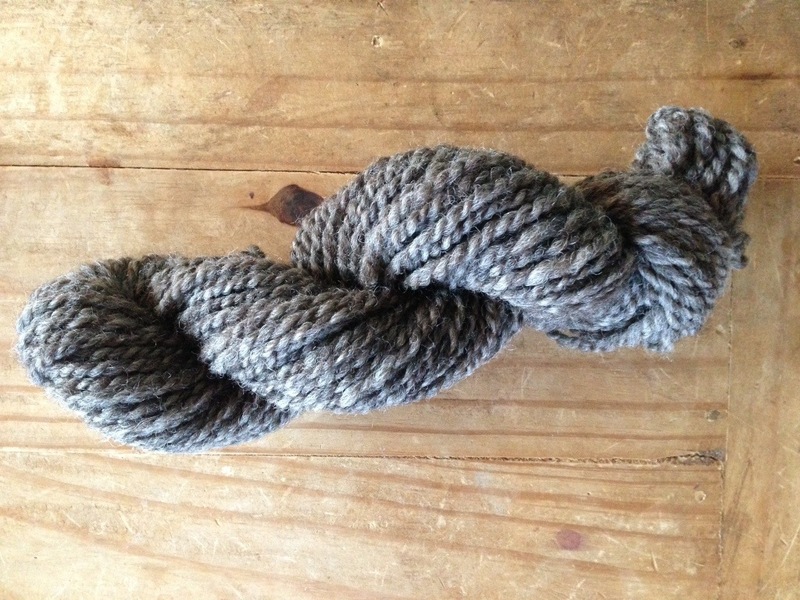 I suggest something fairly simple in order to accent the beauty of handspun. My first was a complicated cabled jacket, my second was the featherweight cardigan. It is the featherweight that I actually wear. All The Time. I am considering the Antler Cardigan for my next, as I think the simple yoke will really look nice with handspun. I think it’s a goal every spinner should tackle at some point. Either that or a shawl. Is it ok part of me wants to encourage you for my own enjoyment of watching you do it? I promise to help. What approach do you think you’ll take for your spinning? Spin all the singles first and then ply? Or spin and knit as you go? I’ve heard good arguments for both approaches. I think I will have to spin and knit as I go to stay focused. Plus, I can spin at night and knit during my commute! Perfect. So we can watch both parts of the process! If you decide to ask for help in picking a pattern to go with your wool I think it would be fun to have a vote/poll. My two cents? Do it! The most important thing about spinning for a sweater is consistent yarn. Spin a sample, wash it and knit a swatch — make sure to save some of the sample plied yarn and the singles. Wash the swatch and then see if you like the fabric. Repeat if you don’t like it. If you do, keep the samples handy and consult as you spin. I also recommend Ann Budd’s books for knitting with handspun as you don’t have to worry about getting a specific gauge. You pick a design and then the gauge and she does the rest for you. Ooh..great ideas!! Thank you so much!! I learned so much from Amy King’s book Spin Control. She advocates sampling and swatching and gives great instructions on how to do it effectively. As a seat-of-your-pants spinner, it was an adjustment for me. But the results are worth it. I love knitting with my handspun and have just started weaving with it too. That is super helpful!!! I forgot about that book, but I love her style. Thanks!! Love the logo! Go for the sweater! The key with me sticking with a project is to make sure I am in love with the pattern. I understand wanting to go with a simple pattern – just make sure that you LOVE simple. It’s a lot of work and if you need to go with a pattern with a little more to it to ensure your devotion – what’s a little more work? Ya know? I will definitely cheer you on! I’m new to spinning but have knit 3 sweaters so far. Can’t wait to see what pattern you pick and that book Susan mentioned sounds cool. Good luck! Thanks so much…great tips! I’m excited to take this on, but I think you have a great point…too simple will not keep my attention as well. Off to search patterns!! Love the logo. Will be interested in what pattern you use and the progress of your project. Knitting a sweater with my own hand spun is on my bucket list for someday. Thank you! I’m digging into patterns now.. At least I will have time to decide while I card more fiber!! Thanks!! That was my hope..! Thank you!! That’s what I was aiming for!